There are an estimated 100,000 people in the United States living with sickle cell disease — a debilitating and life-threatening blood condition that predominantly affects people of African and Mediterranean descent, and Hispanic-Americans from Central and South America. For years, those who suffer from the disease have been treated with temporary solutions, but now advances in gene therapy have opened doors to a possible cure. Ofelia Alvarez, M.D., professor of clinical pediatrics and director of the Pediatric Sickle Cell Program at the University of Miami Miller School of Medicine, explains the breakthrough. 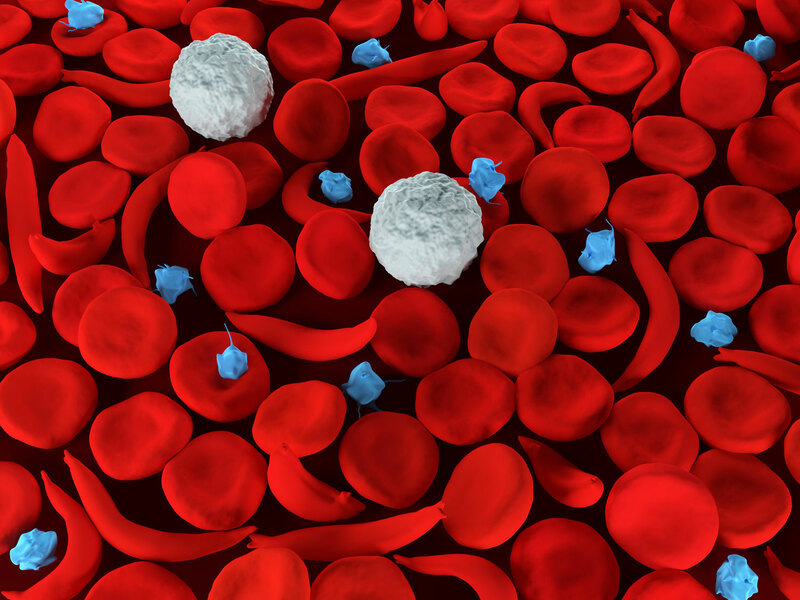 Gene therapy is paving the way for a potential cure for sickle cell disease. Sickle cell disease is a chronic blood disorder that is inherited. It occurs when a person inherits the defective hemoglobin gene from each parent. Hemoglobin is the protein that carries oxygen in the body inside the red blood cells. Because of this mutation, the abnormal hemoglobin, called hemoglobin S, becomes unstable, and when it releases oxygen, the hemoglobin molecules begin to stack among one another to form a chain that deforms the red blood cells. The deformed — or sickled — red blood cells cause problems with blood flow, and the lack of blood flow to different parts of the body causes extreme pain. It’s a cascade of events that happen due to a single mutation in the hemoglobin. What is the new treatment? It’s called gene therapy. The idea is that stem cells are obtained by taking bone marrow or blood from the patient. The stem cells, capable of producing red blood cells, are then isolated from the marrow or blood. This product is sent to a lab that is able to genetically modify the hemoglobin inside the red blood cells to remove the mutation or decrease the chances that the hemoglobin molecules will bind to each other. The new, engineered product is infused back into the patient through a transplant after a brief chemotherapy treatment. Within weeks, the engineered stem cells begin producing new, healthier blood. Only a few patients have been treated with this gene therapy worldwide in clinical trials. The study is still in its early stages, but so far there have been promising results. What do your patients here at UM say about this new breakthrough? We have spoken with many patients who are hopeful about the potential cure. The University of Miami is working on getting the opportunity to be one of the sites to conduct research in this kind of gene therapy. It’s a lengthy process, but I think we have the potential to be one of the sites. At the University, we want to be on the cutting edge of research, so I think we owe it to our patients to provide the newest kinds of cures. I’m all for it. Do you think gene therapy can pave the way to help treat other kinds of diseases in the future? Yes. Right now, there are other conditions in hematology that can be treated using the same technique. For example, gene therapy studies are being conducted here at UM to potentially treat hemophilia, a disorder in which blood doesn’t clot normally.